On Christmas Eve in our parish, we heard a sermon about the mystery of the Incarnation. God loves flesh; how surprising is that?? His love for us is not an abstraction, but a Person born of a woman. Heaven and earth in little space. The King who rules the age. The only exceptions to this counterpoising of medieval and modern settings occur — like bookends — at the beginning and end of the album (don’t leave your device on shuffle, or you’ll miss the point of this collection). Parrott has chosen two rousing late eighteenth-century carols, both rendered with robust enthusiasm. The closing piece is the familiar melody and text of Lo! He comes, with clouds descending, sung about twice as fast as we normally sing it. And launching the collection is a rousing arrangement of Hark the herald angels sing, arranged (most likely) by Charles Burney (1726-1814). 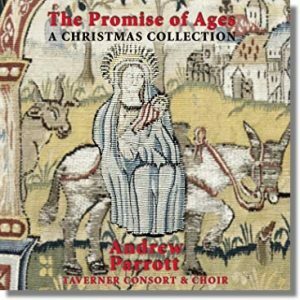 The Promise of Ages: A Christmas Collection, with the Taverner Consort & Choir, conducted by Andrew Parrott, is hard to find on CD, but is available in digital format from Amazon, iTunes, and other digital sources, minus, I’m sorry to say, the informative booklet that accompanied the CD. The texts and historical notes in that booklet help to situate the music in space and time; this music is not just an occasion of beautiful sound, but— like the Messiah and his mother — is part of a meaningful, intelligible, and wonderful history.